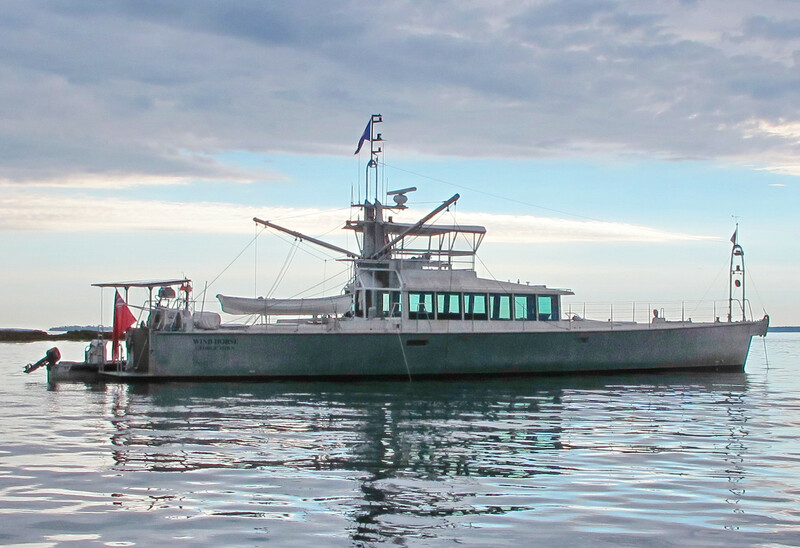 Cochise is certainly eye-catching, and especially so when you realize that you’re looking at the personal cruising “dream machine” of a remarkably innovative designer, engineer, and mariner with hundreds of thousands of offshore miles under sail and power. Fortunately, Steve Dashew is also an outstanding photographer and a motivated blogger, so you too can learn about the evolution of his FPB (Friggin Power Boat) series in deep detail at SetSail.com. But you may also notice that the Dashews announced their retirement from FPB building in September 2017 (while also posting a grand photo history of their half-century afloat together). Well, I’m here to tell you that Steve’s relentless quest to make a good boat better has definitely not retired. 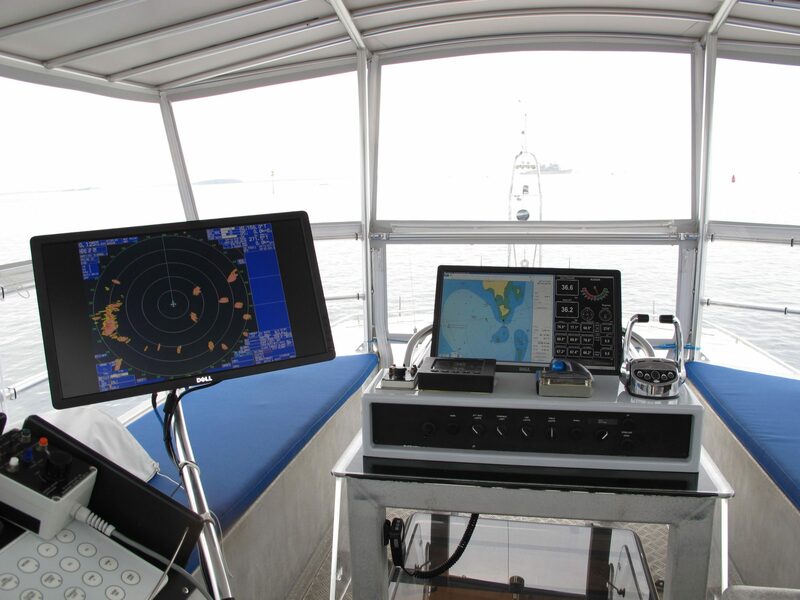 Even though the navigation setup inside that huge combination flying bridge and pilot house was brand new state-of-the-art in 2016, it’s been so radically modified since then that I burst into uncontrollable giggling on first sight. 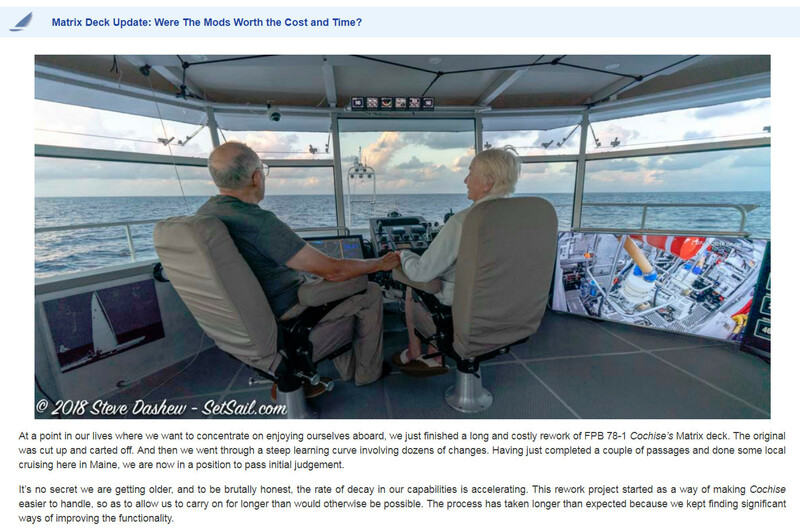 And while the FPB designs are exotic world cruisers well beyond most of our budgets, I think that Steve Dashew’s fresh thinking on helm ergonomics — perhaps best defined as “the process of designing or arranging workplaces, products and systems so that they fit the people who use them” — is a good story with wide applications. So let’s start with the original FPB, the 83-foot Wind Horse, on which Steve and Linda cruised 50,000 miles. 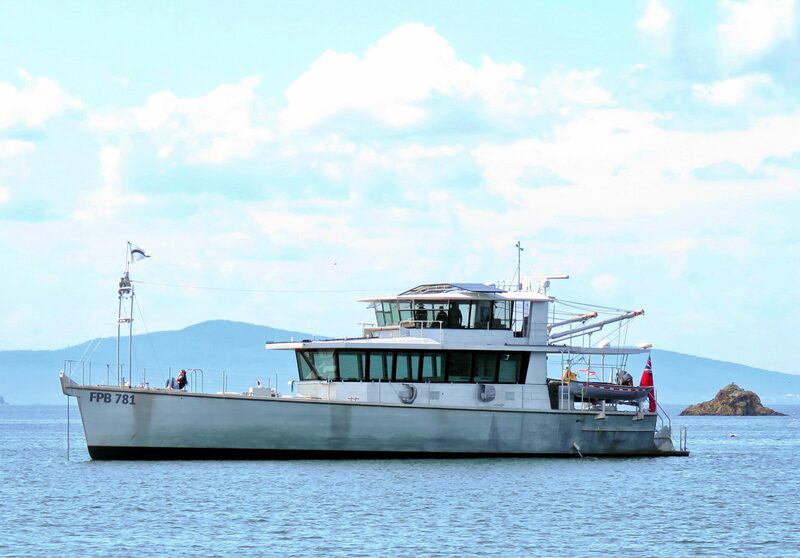 Obviously the prototype worked out, and the essential idea of a long, lean low-maintenance hull with a luxurious “great room” combo galley, salon, and lower helm is common to all five designs. But look how the flying bridge evolved. By the time I first visited the Dashews aboard in 2011, it had already gotten a permanent soft enclosure, and Steve wasn’t done. But if I’d kept up with Steve’s SetSail entries early last year, I would have known that he completely tore out Cochise’s original matrix helm setup, largely in pursuit of optimal night vision. 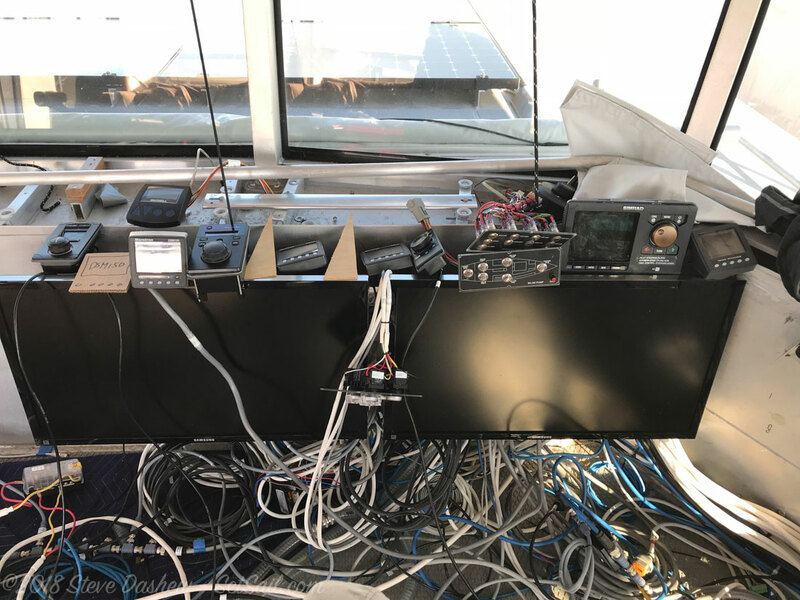 As he’d learned from the large TVs installed near the lower helm in both his FPBs, a big screen can also be great for navigation and they don’t mess up night vision if they’re installed low and vertical. And he’d also experimented with numerous prototypes trying to make the new helm work while either standing or sitting. However, even if I’d read those SetSail entries before climbing up to the revised matrix deck last summer, I still would have gotten giddy with astonishment I’m pretty sure. Please click large the panorama above to better see what I mean, as in: Holy Cow! Those three huge monitors are readable from most anywhere on the bridge and yet they don’t impede the 360-degree window view. There’s also more floor space, you can stand close to any of the windows, and the screens swing and/or tilt for different use modes. 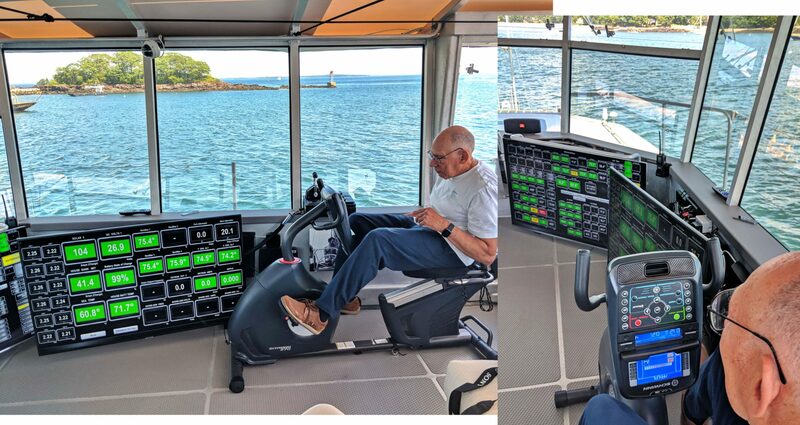 For instance, if Cochise was underway in this exercise machine demo, Steve might have swung the two 55-inch monitors out for better sight angles, and note that they can stream various onboard cameras as well as the Simrad NSO evo3 navigation and Maretron monitoring seen in my photos. Note too how he can reach a boxed set of engine, rudder and autopilot controls which is on a long cable bundle and thus can be moved around when docking. 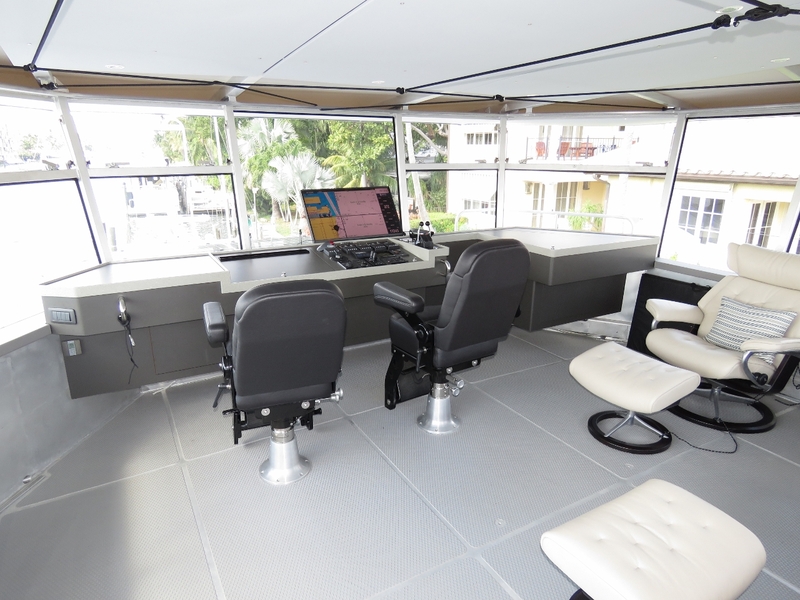 It’s a gym, it’s a lounge, it’s a pilot house…action oriented flexible ergonomics at work! And did you notice that the control head on the recumbent exercise bike is upside down? That’s so Steve can see the screens better and, more importantly, not lose his view through the forward windows. Please don’t let the supposed distraction of big screens distract you. When the nav windows and physical ergonomics are set up right — reliable alarms help too — you can focus on what’s outside the boat. 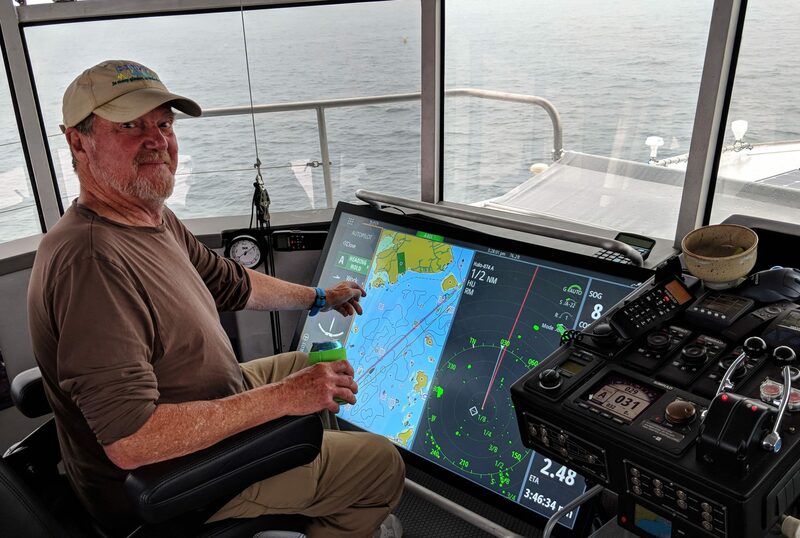 Here’s Steve at the main navigation monitor, a 49-inch touchscreen which can easily be adjusted anywhere from verticle to horizontal, and I’m happy to add that I got to try it out underway. Better yet, in terms of testing, the short and easy Sunday afternoon cruise to Rockland turned out more challenging. 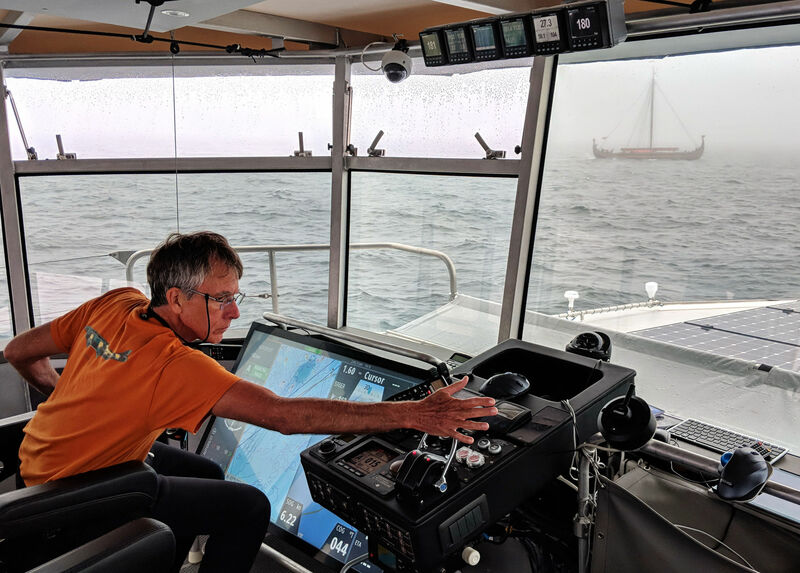 The goal had been to see the 115-foot replica Viking longship Draken Harald Hårfagre make a grand entrance into Rockland, but when she was delayed by foul winds and a balky diesel, we headed out of the Bay toward an AIS-assisted rendezvous. The fog came in thick sometimes, the seas built as we entered open waters, and Luis Soltero really was pretty serious as he maneuvered Cochise while Steve took photos from a wing deck. But though neither Luis nor I were familiar with driving a big boat with a rudder joystick — my early 70’s time in offshore oilfield vessels excepted — we both fell rapidly in love with Steve’s latest helm setup. It may look over-the-top, but it works really well. In this scene, for instance, I’m dodging lobster trap buoys and lobster boats in the somewhat tortuous Muscle Ridge Channel while comfortably seated because I could still see out of the boat well, or still easily reference radar and chart when I wanted to stand up for a closer look in any direction. And if a 12-inch touchscreen MFD is invariably easier to use than the same interface at 7 inches, imagine how well 49 inches work. 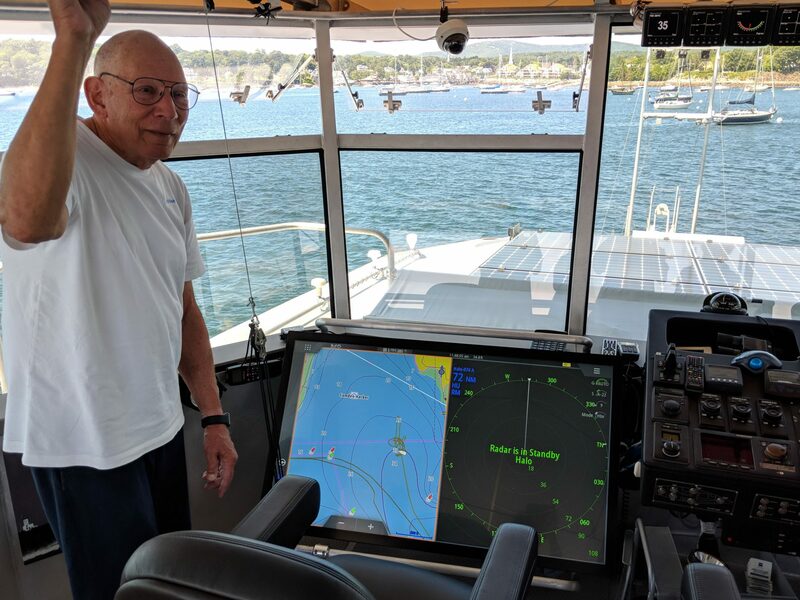 I don’t know if the helm setup on Cochise will be changed again next summer — Steve seemed fairly satisfied, at least last July — but I’m not suggesting that we should direct copy his design ideas anyway. What I find most inspirational is his willingness to defy conventions to get the ergonomics that suit he and Linda, and the way they use their Friggin Power Boat, and even to replace one solution with another. Thank you, Mr. Dashew.